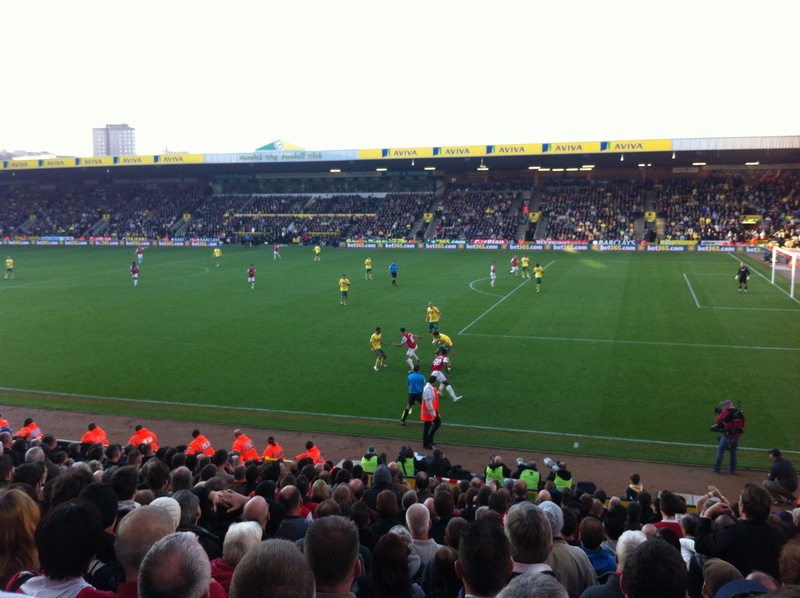 New on Away Days is Lewis Millen's first hand account of Arsenal's trip to Carrow Road to take on Norwich. Lewis was there to take in all three goals and recounts his experience of the trip of to Norfolk. This was a fixture I'd been looking forward to for some time. 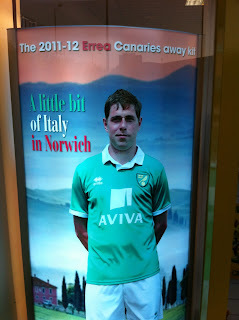 I remember watching Norwich in their pomp back in the '80's and Carrow Road is a ground I'd wanted to visit since then. Coupled with this, the Canaries have been at the vanguard of the newly-promoted Premier League sides playing progressive football without fear under the stewardship of a bright young manager in Paul Lambert. 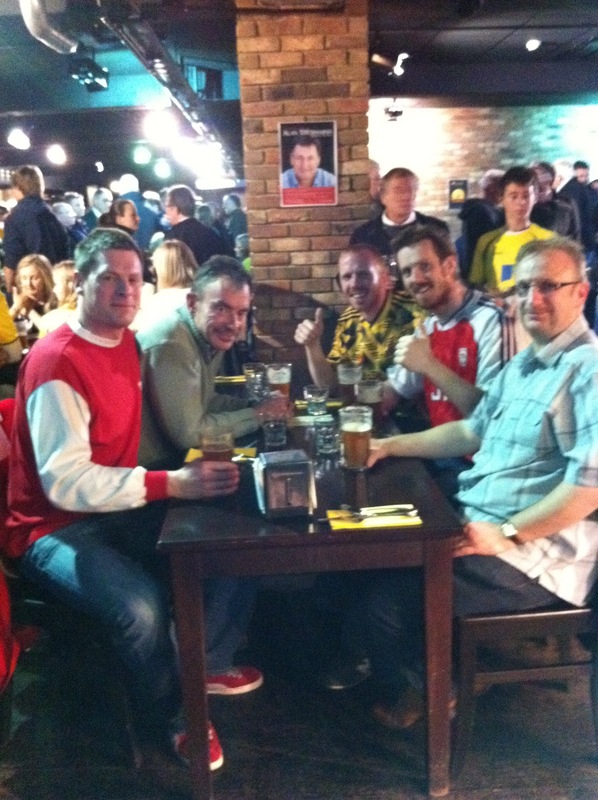 I travelled to this match in the company of my brother Joe, my cousin Sam and two of my good mates Trev and Jan. The five of us hooked up at the Arsenal Supporters' Club on St. Thomas' Road at 7am to take the coach. Everybody was on good form, though a sad note was struck with the news that Josie - a much-loved member of the AFSC who helped in the shop - had passed away the previous day. Rest in peace Josie. This was one of those atmospheric away days with a thick mist clinging to the ground for much of the morning - including during our brief stop in Thetford Forest - but this slowly gave way to glorious Autumnal sunshine as we arrived in Norwich. First up, we headed from the coach park to one of the local hostelries by the river where home and away supporters mixed freely. A comment at this point about the police; I think it's fair to say that all the Old Bill we came across in our time in Norwich were friendly, polite and helpful and they deserve credit for that (I'm generally not one for dishing out compliments to the constabulary I should point out). And as for the locals we met - they were excellent - there was good banter and not a hint of aggravation. With beers on board, we took the short stroll to the ground and as we went through the turnstiles, we were greeted by a wall of noise with the Gooners around the small bar in good voice. There were a few new chants on offer, including a rather peculiar one which was slightly modified mid-song by a black lad who - hoisted aloft and onto his mates' shoulders - pointed to himself as he chanted "John Terry hates me…". The one thing that was evident from the kick-off was that the Norwich team were fully committed and well-organised as one would have expected. Despite all the talk pre-match of the need for Arsenal to be switched on and 100 per cent focused after the international break and against a side which should have beaten United at OT, it struck me that we were a bit lethargic and seemed content in the early exchanges to engage in a spot of head-tennis with the home side rather than grabbing the game by the scruff of the neck, getting the ball on the floor and taking the game to Norwich. One of the regular shouts from one chap behind me throughout the match was "win the second ball Arsenal", and he had a point. After the game settled down into a pattern, Arsenal created a number of decent chances which were either squandered, excellently blocked by the defender Martin, or dealt with by the pretty impressive Ruddy goalkeeper. 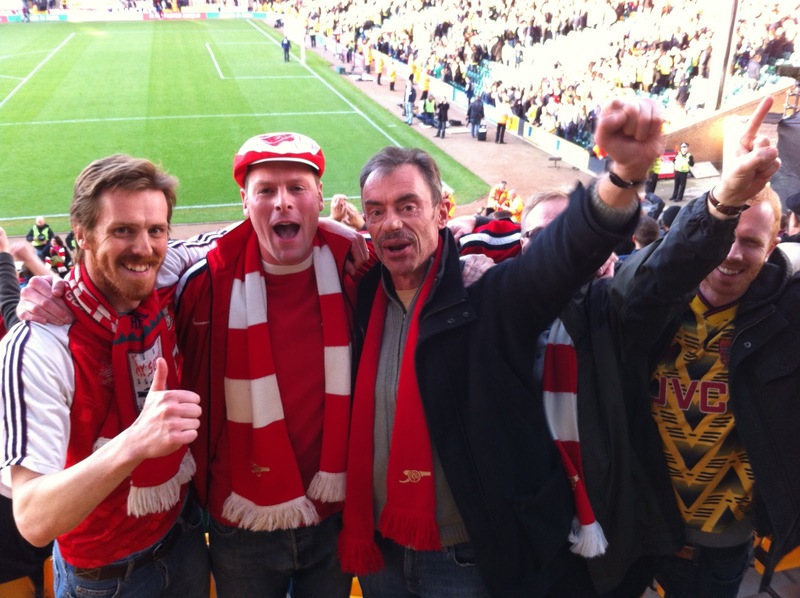 The Norwich goal was irritating, but nonetheless unsurprising and Mertesacker did look shaky throughout the match. Vermaelen though, did an excellent job of mopping up for his hapless centre-half partner on a number of occasions. The other thing I noticed was that Norwich seemed to specifically target our left-hand side as a weak spot with Morison running the channels against Santos. And the linesman on our side of the pitch produced one of the most inept performances I have seen in quite a while; I am genuinely unsure as to whether he got a single decision right and even Theo had a go at him in the second half. Gervinho seemed to not to believe he had the beating of the Norwich right-back and did not have his shooting boots on, but cut inside well in the build-up to our first goal and worked hard. Our midfield did not have it's most effective afternoon. Arteta, and particularly Song were pretty quiet and the majority of the running in that area of the field was done by Ramsey. Theo had had a relatively quiet first half apart from his excellent run and pass for his goal, but in the second half he looked like a different player; he clearly wanted to take responsibility and make his mark. RvP, as has been elaborated on by many others, is in absolutely majestic form, and even when things weren't coming to him in a more advanced position in this match, he was always willing to drop deep and help link the play. Another excellent performance from the captain. The first half was frustrating and there was a sense of anxiety in the away section with not the same intensity of singing I'd been involved with at Stamford Bridge recently. 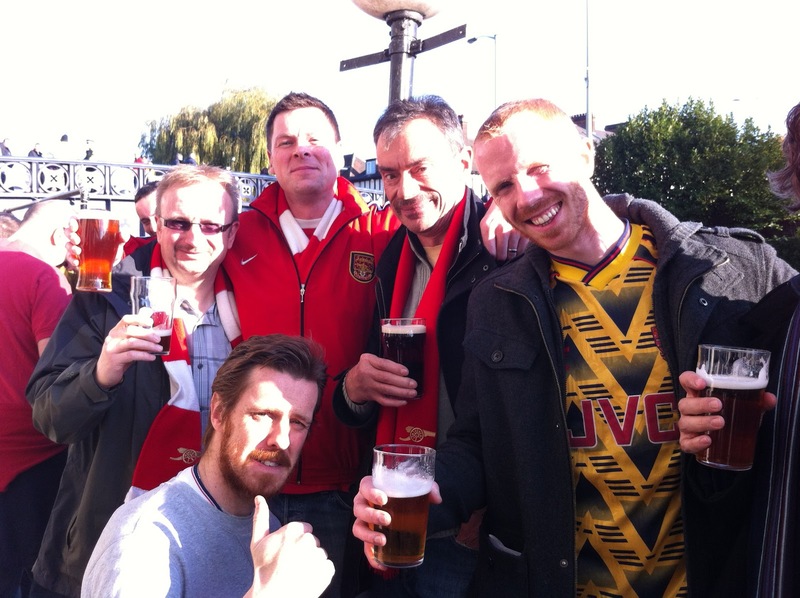 Over our half-time pint there was talk amongst us that Arsene could have done with balling them out in the dressing room. Whether he did or not is debatable, but the second half was nonetheless much more assured and we never really looked like conceding another goal and it was more a question of whether we would score again. Which of course we did, with a sumptuous finish from van Persie. 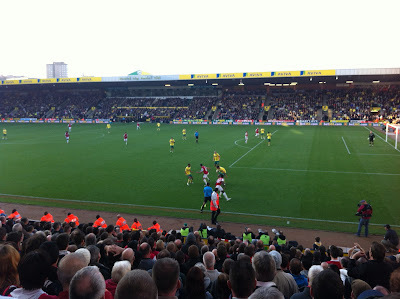 A Carrow Road record attendance was announced during the match, to which the immediate refrain from the away section was "You've only come to see the Arsenal". At the end of the game, the home supporters, who had been very vocal, particularly at the start of the game, were a little fractious. Good to see at the end of the match Arsenal players acknowledging the travelling Gooners (we're starting to see more of this) and there was a nice moment when Per Mertesacker made a particular point of clapping us and a rousing rendition of the song about our BFG ensued. My overall take on this match was that this was a classic example of the Arsenal not firing on all cylinders but getting a good result and one which we deserved. After the match, we headed to Delia's "Yellows" restaurant - nearly walking into Alan Smith along the way (he was apparently rushing to the TV studio) - for a very pleasant meal with beer and good company. The pillar next to our table had a flyer on it advertising a an audience with Alan Titchmarsh at £80 a head…no further comment required I reckon. It was evident here again what a friendly bunch the Norwich supporters are. Props to them. And then the stroll to the train station to get home. I had to include this snap I took through the window of the NCFC club shop. My brother said to me when Holt was brought on towards the end of the match that he is a big unit - I don't think he was necessarily referring to the small spare tyre in evidence around his midriff having said that. The expression "pub footballer" springs to mind (and whether I'm referring to Holt or my brother I'll leave you to decide). More beers on the way home and a consensus of opinion that an excellent day was had by all. AshburtonGrove.co.uk is looking for a fan heading to Olympiacos, Manchester City and Aston Villa in December to write about their away day experience. If you'd like to get involved, contact us via Twitter or Email.